Farm Puzzle Story 2 is an awesome matching casual game! Use your amazing skills to tap and combine the vegetables. 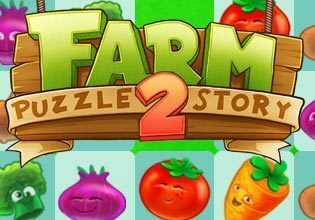 Carrots, tomatoes, broccoli, potatoes and many other healthy vegetables await you in this fast paced and addicting game. Get mighty boosters at the beginning of each level and use them to win even the hardest battles - losing is not an option. Once you start playing, you will not be able to stop. Farm Puzzle Story is a FREE match-3 game that gives more 30 levels packed with fun and enjoyment! Put veggies together to earn apples and points! Don't forget to control the number of moves left, because if you don't manage to combine vegetables well, you will run out of moves and lose. Be smart, be fast and win!